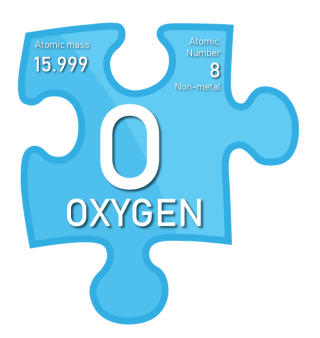 O2 is the oxygen molecule most commonly found in the earth's atmosphere; it has two atoms of oxygen. It has a periodic table number of 8. Oxygen makes up approximately 21% of the air we breathe. Oxygen is important to every cell in our body. Oxygen through a process called oxidation, chemically changes food and liquid into energy. It is breathing simple oxygen that controls our gene’s, contracts our muscles, repairs our cells, feeds our brains, and even calms our nerves. Not only that, but breathing is our body's chief cleansing tool. Higher pressure = more 02 (Oxygen) dissolved in plasma. Breathing 100% oxygen at atmospheric pressure or applying topical oxygen without enclosing the patient in a pressurised chamber does not produce the same affects and is not recognized as hyperbaric oxygen therapy.